Albuquerque artist Shane Shane created a biodiversity sphere out of a 500-gallon propane tank from the 1950s. Each detail is more intricate than the next. And Albuquerque artist Shane Shane wanted it that way. Out of a 500-gallon propane tank from the 1950s, Shane was able to create a world. It’s one of wonder and it’s one with a message. Shane’s “Biodiversity Sphere – Endless Prospect of Life & Wonder” took nearly three months of work. Each piece of the project was hand cut by Shane and Shaun Myers. There are dolphins, elephants, rhinos as well as an owl, a wolf and many sea creatures included in the piece. Inside the hollow sphere, Shane has set up a propane tank, which lights up the entire sculpture at night. 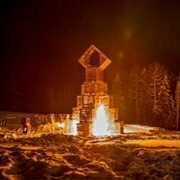 Shane is making his first trip to Telluride this January 20 to participate in the 3rd annual Festival both his Biodiversity Fire Sphere and a new creation called Obelisk. Image by Albuquerque Journal photographer, Jim Thompson.